The sports complex. municipal property, is managed by A.S.D. Polisportiva Progresso. 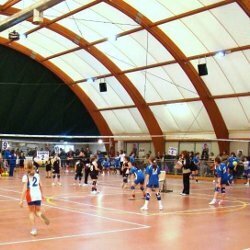 You can find a bowling hall with six bocce runs, a field useful as well for baseball as for softball, the Palatenda where it is possible to play futsal (a variant of football mainly played inside between two teams of five players each), roller skating, judo and dancing classes. In the Palazzetto dello sport you can play basketball, mini basketball, volley, mini volley, but also free climbing and skate board.